I tried to sum up the most important points of the Homepage in the following text. If you have further questions please don't hesitate to contact me via mail or phone (please talk on the Mailbox, I'll definitly call back) to ask me. Having done many different Sports myself (Judo, Weight Training, Volleyball, Tennis, American Football, Rugby...) I experienced a few injuries and surgeries on my own body. That's why I know the problems occuring through acute traumas and overload as well as the Rehabilitation after surgery firsthand. It's my personal concern to obtain your goals best possible together with you, both through passive/manual Therapy and especially with active/training Therapy. Your individual Therapy will be planned according to your Problems, your goals and wants and your referral from your doctor. The Treatment can be either in an acute Phase (after Injury or Surgery), later on in your Rehabiliation or with chronical Problems. 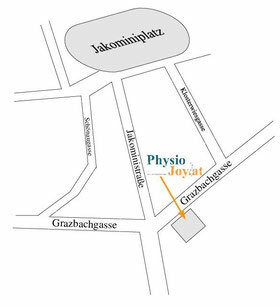 Please note that you need a referall from your Doktor to have physiotherapeutic treatment! You will get back a part or all of the Bill from your insurance company (depending on your Insurer; the refunds from most austrian insurers are displayed in the Table in the Tab "Kosten"). If you are under 26 years old you get 50% off of your Therapy.